Today the Friday sermon delivered by Hazrat Khalifatul Masih was a tribute to the late Maulvi Abdul Wahab Adam Sahib. Huzoor said the Promised Messiah (on whom be peace) received the revelation: ‘People whom We shall direct by revelation from heaven will help you.’ (Tadhkirah, p. 850, 2009 edition) even before his claim and received it many times. Later, in 1907 this revelation was accompanied with: ‘… They will be coming to you by every distant track. (Tadhkirah, p. 975, 2009 edition). This revelation has been fulfilled with great glory, during the lifetime of the Promised Messiah (on whom be peace) as well as with reference to Khilafat established after him and through him. Not only are these individuals inclined to the Jama’at, rather they dedicate their lives to the cause of the mission with great zeal and sincerity and thus become excellent helpers of the Promised Messiah and are also helpers of his Khulafa. Some of these people came from far off countries to learn faith and took it back to their countrymen. They came at a time in the 1960s and 1970s when correspondence with their home countries could take up to six months. Yet, they came with high resolve and perfect conviction to dedicate their lives to serve faith and were ever ready to make every sacrifice for the mission of the Promised Messiah (on whom be peace). This is a testimony of the truthfulness of the Promised Messiah as well of Khilafat e Ahmadiyya. Such people are pious-natured and God’s grace is on them and it makes them shine brilliantly like a star. One such sincere and devoted individual was respected Abdul Wahab Adam Sahib. He came to Rabwah in those times from a far-off country to seek knowledge of faith and became an excellent helper of Khilafat. He came to Rabwah when it was still being built and communication with Africa took very long. He operated on every gesture of the Khalifa of the time and accepted every decision of the Khalifa of the time with complete conviction and not only every instruction, big or small, but he used to be deeply concerned to even fulfil every wish of the Khalifa of the time. Huzoor worked with him for eight years in Ghana and found him so and also found him so when Huzoor became Khalifatul Masih. Huzoor said it was known that Wahab Adam Sahib passed away recently. He had been in the UK for the past one year and had only returned home in late February. His duration of service to Jama’at was over fifty years. Huzoor said his personality and loyalty cannot be stated in few words but Huzoor presented a few aspects of his personality. Ahmadiyyat came in Wahab Sahib’s family through his parents and he was a born Ahmadi. It was his father’s deep wish for his son to become an Ahmadi missionary and although he passed away while Wahab Sahib was very young, his mother ensured to fulfil his father’s wish and sent him to Rabwah along with Basharat Rasheed Sahib. Wahab Sahib was born in district Adansi, Ghana in 1938 and received his early education locally. He was sent to Jamia Rabwah in 1952 and in 1960 he obtained his Shahid degree. He returned home to Ghana and served there till 1969. He then became principal of Jamia in Ghana. At the time residences used to be small mud huts with no bath rooms. Straw mats used to be stood on their sides to create privacy for bathing. In 1971 he was appointed naib-Imam Fazl Mosque, London. In 1975 he was appointed Amir and missionary-in-charge Ghana, a position he served for thirty nine years. Wahab Sahib was sent to Pakistan as an adolescent to be trained at Jamia, Rabwah along with Saleh Sahib to increase the number of indigenous local teachers in Ghana. They both worked very hard. Saleh Sahib fell ill in 1957 and was sent back home where sadly he passed away in 1958 at the age of 19 years. Meanwhile Wahab Sahib continued with his studies and returned home as a missionary. This inspired many other young Ghanaians to become missionaries and later a Jamia was opened in Ghana which has now gained the status of international Jamia and young men from all over Africa go there to attain Shahid degree. Wahab Sahib used to say that in early days there was no electricity in Rabwah and drinking water had to be brought in from out of town. The roof of the hostel building was made of unbaked bricks and leaked when it rained. Wahab Sahib used to joke that at times their suit cases would float in rain water! He also narrated that as a student he found studying logic and jurisprudence in Urdu quite difficult. Once exam was approaching and he was quite anxious and went to see Maulana Rajiki with a friend to ask his prayers. Maulana Rajiki raised his hands for prayer and asked them to join in prayer. After finishing with prayer Maulana Rajiki told them that he while praying he saw the Promised Messiah in a vision with his blessed hand on the heads of both the students. He interpreted this to mean that they will be successful with the blessings of the Promised Messiah. Miraculously, Wahab Sahib stood first in his class! Wahab Sahib had received many honours, among them were the following: He was the first African central missionary from Ghana. He was the first Amir and missionary-in-charge of Ghana. He was the first African Ahmadi to have the honour of becoming Amir Maqami Rabwah in representation of Khalifa of the time. He was the first African central missionary who was enabled to serve in Europe. He was also enabled to tour different countries in representation of the centre, countries like Canada, Germany, Benin, Mali, Ivory Coast, Nigeria, Burkina Faso, Liberia, Sierra Leone and Jamaica. He established a foundation in his mother’s name which helps the needy. Ghanaian Jama’at made vast advancements while he was Amir. There are more than four hundred schools in Ghana run by the Jama’at and seven large hospitals and two homeopathy clinics. Wahab Sahib arranged for large billboards with the Promised Messiah’s (on whom be peace) photograph erected on two highways of Ghana with the message that the awaited Messiah has come! Wahab Sahib also received many worldly accolades: At the Interreligious and International Federation for World Peace, Korea, USA gave him an award of ambassador of peace for his selfless services for peace. Government of Ghana awarded him a special national award of Companion of the Order of the World in acknowledgement of his work in education, health, agriculture and national peace. In 2007 University of Cape Coast, Ghana awarded him an honorary PhD. Other responsibilities held by Wahab Sahib were: He was a member of Centre for Democratic Development, Ghana. He was the vice-chairman of Ghana Integrity Initiative. He was a member of National Peace Council. He was a co-founder and national president of Council for Religions and he was a member of the National Reconciliation Commission. During the difficult times faced by the Jama’at in Pakistan in 1974, Wahab Sahib worked night and day with the Imam of the Fazl Mosque and relayed information to press and media. He was made deputy editor of the magazine Muslim Herald in 1973 where he initiated two new columns entitled London Diary and Questions and Answers. Vice President of Ghana Amissah-Arthur has paid great tribute to Wahab Sahib and has said that he was a glorious leader of the nation and will never be forgotten. Former President of Ghana John Agyekum Kufuor said that he was a great religious and national leader. Dr Mustpha Ahmad, a Member of Parliament and state minister said that Ghana has lost an estimable son and said that he will always be remembered. Archbishop of Accra said that he was a standard-bearer of service to humanity. A bishop of the Methodist Church said that a peaceable man has gone to God. Deputy Chairman Muslim Commission of Ghana said that Ghana has lost one of its big pillar. Wahab Sahib’s son says that his father was most sincere and loyal to Khilafat and wrote to the Khalifa of the time about every small matter. A week before passing the doctor advised that he should be hospitalised. Wahab Sahib said he would first seek permission from Huzoor. In 1990 one of his sons went abroad and complained that communication with back home took very long. Wahab Sahib told him about the times he was in Rabwah and it took six months for his letters to reach his mother. He was an extremely hard working person and at times would start work after Fajr and not stop except for Salat and food. He always wrote to Huzoor in Urdu and in his own handwriting. He had a very pleasant personality and even in his last days when people around him knew his health was declining he would always say he was feeling better than before. Some people thought perhaps Wahab Sahib did not know the nature of his illness, pancreatic cancer, however, he knew very well but had submitted to God if He restored his health or had something else destined for him. When he went to Germany and was diagnosed he smiled and said he had a God and a Khalifa of the time whom he writes for prayer. If his passing away was destined, he was content about it. Wahab Sahib was extremely hospitable and served beverages to his guests himself. He was extremely compassionate. Once a widow came to him seeking help to start to make a living. Although Wahab Sahib did not know her at all, he helped her to start a business. He was very loving towards children and distributed chocolates and balloons among them. Huzoor said some people had erroneous views about him, but Wahab Sahib said that he looked after people even by enduring hardship himself. He was extremely loyal and obedient to Khilafat and sought advice in every matter and counselled others to do so. Wahab Sahib was a role model for people. Amir Sahib of Mali says that he remembers during the time he spent in Burkina Faso when Wahab Sahib used to live in a mud hut there. Burkina Faso Jama’at was established in 1986 due to his endeavours. When cycle riders from Burkina Faso arrived at their destination Tamale during the Khilafat Centenary commemoration, Wahab Sahib travelled two to three hundred miles to welcome them. When the question of performing Hajj was raised Wahab Sahib remarked that he had already performed Hajj. He explained that during the time of Hazrat Khalifatul Masih III (may Allah have mercy on him) he decided to go to Hajj but was met with opposition and visa was not granted to him. When he mentioned this to Huzoor, Huzoor kept quiet and then said that God had shown him a vision in which Wahab Sahib is circumbulating the Ka’ba and seventy thousand people are performing Hajj with him! Steadfastness was a great virtue of Wahab Sahib. His son-in-law was martyred in USA when robbers took his life. The day this happened was an annual event of Jamia Ghana. Wahab Sahib was given the terrible news about his young daughter with three little children yet he went on to attend the Jamia event for three to four hours and only later told others of the tragic news of that his daughter was now a widow. A Russian friend says that he went to Jalsa Ghana in 2008. Wahab Sahib invited him to his house and greeted him in such a warm manner that the guest forgot all the tiredness of his long journey. He remarked that he rather liked Wahab Sahib inquiring after the well-being of the President of the country and an attendant in exactly the same manner. Another time he gave his own Prayer mat to the guest as he could not find one and the next day arrived with two Prayer mats as gift for him. Majid Sahib says that Wahab Sahib was completely loyal to Khilafat. Last year he came to the office in the afternoon where others were having lunch and he was also offered to join in. He declined saying he had to immediately telephone Ghana to relay the instruction of Khalifa of the time and would eat later. He was so humble that he would stand up when Majid Sahib came to office saying he did so out of respect of his superior. Once while having lunch in the office Majid Sahib felt the food was too salty. Wahab Sahib brought his own food for him as it was not salty. Wahab Sahib used to coach people the etiquette of writing to Khalifa of the time and advised not to use tippex/correction fluid if a mistake was made as it was discourtesy to Khalifa of the time to send him a letter like that but to re-write the letter. Wahab Sahib did not procrastinate and always finished what he started and was very encouraging to others. Once he had to travel two to three hundred kilo metres on an extremely bumpy dust road to a Jama’at event. Upon reaching the destination he learned the event had been postponed. A telegram had been sent but had not arrived. Wahab Sahib did not express any disapproval at this. Many life-devotees write that in early days when there would be scarcity of milk for their little children, Wahab Sahib would promptly arrange for milk supply. Once he met someone in Rabwah and was introduced to him. When the person explained whose son he was Wahab Sahib stood up and embraced him again saying he was the son of his teacher! Khalid Sahib of the Russian Desk writes that when he came from Russia and met Wahab Sahib he commented: You are a very lucky person. And explained that the Promised Messiah (on whom be peace) has foretold that Jama’at will spread in Russia and Khalid Sahib was lucky to be part of the blessed process. Once Wahab Sahib’s photograph was seen on the front page of a Ghanaian newspaper and it was explained that it was given prominence in light of his peace-making efforts prior to elections in Ghana. Shamshad Sahib missionary USA writes that when he served in Ghana he was transferred to Sierra Leone. The Amir Sahib went to Wahab Sahib and requested that Shamshad Sahib is not transferred. Wahab Sahib counselled him about the workings of the administrative system of the Jama’at and said that at the top is our Khalifa of the time who wishes Jama’at to progress in the entire world and indeed the Khalifa of the time knew where Shamshad Sahib was needed and was therefore being transferred. Mubarak Siddiqui Sahib relates a humorous incidence when Wahab Sahib travelled in his taxi and did not know Mubarak Sahib who played a joke on him and asked him why he wanted to go to an Ahmadiyya mosque! Unbeknown Wahab Sahib started doing Tabligh to Mubarak Sahib while Mubarak Sahib continued with his joke. When they arrived at the destination he held Mubarak Sahib’s arm and asked him to come along and see the mosque for himself. This is when Mubarak Sahib explained everything and told him that he was in fact an Ahmadi and a huge fan of Wahab Sahib. Wahab Sahib laughed a lot at the joke and said had he not explained he would have carried Mubarak Sahib to the mosque! Ata ul Mujeeb Rashed Sahib writes that when once Hazrat Khalifatul Masih III (may Allah have mercy on him) went to Islamabad and was out of town he appointed Wahab Sahib as Amir Muqami and appointed Maulana Abul Atta as the deputy Amir. He did this to make a point. Perhaps some people wondered why such a capable Ghanaian was not made Amir of Ghana and the Khalifa of the time wanted to indicate that let alone make him an Amir of Ghana, he was being made Amir Muqami Rabwah! Certainly, Wahab Sahib instilled a regard for Khilafat in the hearts of Ghanaian Ahmadis. While Wahab Sahib was in the UK recently, Ghana Jama’at decided not to hold their Jalsa saying their organisation was not good. Huzoor was displeased at this and told Wahab Sahib that while he was here people in Ghana were having strange thoughts! Wahab Sahib was very sad at this and telephoned Ghana and spoke to them softly, advising them. Bilal Sahib writes that this was the only time he had ever seen Wahab Sahib serious and worried. This was borne of his love for Khilafat. On his return he had the entire Ghanaian Amila write letters of apology to Huzoor and they held their Jalsa which was more successful than ever. Indeed, this was owing to his obedience to Khilafat. Once Wahab Sahib was on leave but Hazrat Khalifatul Masih III (Allah have mercy on him) told him he had no leave and sent him off to work in villages. Wahab Sahib said the useful experience he gained from this made him realise the wisdom behind the decision of the Khalifa of the time. While he was here in the UK his television broke down on the day he had to watch some important broadcast from Ghana on which he had to report Huzoor. He asked Salim Haq Sahib to fix his television. Salim Sahib told him that although he would not be able to fix his television his children could. His children fixed his television and Wahab Sahib was delighted, he gave them chocolates and said these were the soldiers of the Messiah and will be the source of advancement of the Jama’at. Huzoor said he had also lived in Ghana and had also stayed at Wahab Sahib’s house. He looked after small matters like Pakistani diet of guests, not just for Huzoor but all Pakistani guests. One quality of his that Huzoor observed was observance of Nawafil and Tahajjud. Once he travelled long distance and arrived at Tamale late in the evening. Had dinner around 11.30 p.m. and retired at midnight. Huzoor says he was awakened at around 1.30 a.m. when Huzoor saw Wahab Sahib in the courtyard of the mosque offering Nawafil with great humility and meekness. He would have hardly slept for half an hour or so. 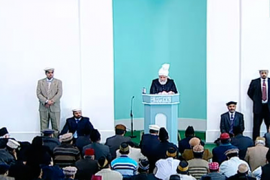 Huzoor said that once a missionary in Tamale spoke disrespectfully to Wahab Sahib in front of non-Ahmadis. Wahab Sahib did not react other than saying to him in Urdu that he could have at least taken care in front of non-Ahmadis. Huzoor was angry at the attitude of the missionary and told him off but Wahab Sahib was only concerned about the dignity of the Jama’at. That missionary went to Rabwah and was relieved of his dedication but Huzoor says he was astonished to see Wahab Sahib’s steadfastness. Wahab Sahib had no worldly greed. In early days Jama’at gave land plots to workers on reduced prices. Last year Wahab Sahib wrote to Huzoor and said that he wanted to give his plot of land to the Jama’at, perhaps because the Jama’at was spending on his treatment here. It was a property worth 250,000 Rupee that he gave to the Jama’at. Wahab Sahib was granted great honour in death by the government of Ghana. His funeral took place in the State House. Where the President, Deputy President and other Ministers expressed their views and Wahab Sahib was afforded full protocol. Religious leaders also paid tribute to him. Our Jamia principal spoke on the Islamic philosophy of life and death and Wahab Sahib was buried in the Moosian graveyard in Ghana with full honour. Ghanaian TV gave coverage to the occasion. Wahab Sahib leaves behind his widow four sons and three daughters. May God keep them all in His protection and keep them connected to Khilafat and the Jama’at and grant them steadfastness. May God elevate the station of Wahab Sahib and grant him place near His beloveds. Huzoor said he would lead funeral Prayer in absentia of Wahab Sahib.